Last month, we attempted to provide a comprehensive listening guide to all the indies in Greenpoint. That’s the what of record label culture in Brooklyn — but what’s the how, and the why? Wednesday, at the Newsroom, we’ll attempt to answer those questions. 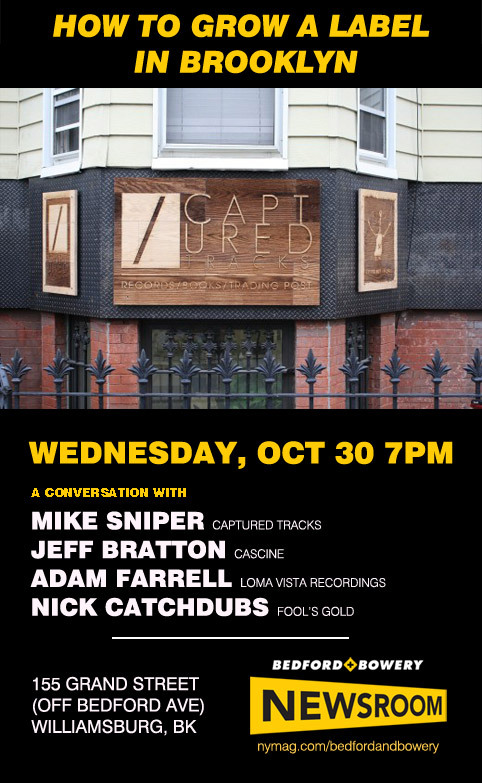 We’ve organized a panel that includes Sniper; Jeff Bratton, who owns and operates the boutique pop label Cascine; Adam Farrell, the creative director for Loma Vista and previously the marketing and creative director for Beggars Group; and Nick Catchdubs, the co-founder of the indie hip-hop label Fool’s Gold.We’ll see you Wednesday at 7 p.m., at 155 Grand Street, off of Bedford Ave, in Williamsburg. As always, the event is free.